GxP is a popular concept used in pharmaceuticals and used as a common term for all good practices used in pharmaceuticals. One of the biggest concerns that the pharmaceutical industry constantly attempts to address is the safety of its products. GxP is a collection of regulations that aim to resolve this matter in a systematic and wholesome manner. The concept of GxP requirements in Pharmaceuticals was established by the United States Food and Drug Administration. The term itself encircles many different regulations in many different fields. The G stands for "Good" and the P stands for "Practice". The 'X' in the middle is a variable that can be substituted with any word that appropriately completes the acronym. For example, 'x' is replaced by 'M' to make it GMP which represents 'Good Manufacturing Practice'. GxP extends to many regulated industries such as cosmetics and food as well besides pharmaceuticals. Regulators for GxP are spread out throughout the World. Some of the popular regulators include FDA in the US, TGA in Australia and HS-SC in Canada. So what is the main purpose of GxP? In simple terms, it is a set of guidelines in place to ensure that products and services are safe. To elaborate on this point, GxP enforces regulated industries to stick to very specific and secure manufacturing processes and storage procedures, ensures safe clinical trials involving human subjects and also establishes effective research standards for non-clinical laboratory trials. The distribution and publication of the above-mentioned enterprises are also supervised by GxP. As popularly stated, GxP focuses on extremely effective and efficient documentation. What exactly do this terms mean in the context of GxP? It refers to the clear establishment of various contributions in parts or whole to a particular product or study. Everything including who contributed what and the impact of those contributions are documented. Every step of the manufacturing process is documented as well. This way, it becomes simple to track the origins of any product and also verify every intermediate procedure it went through while it was being manufactured. 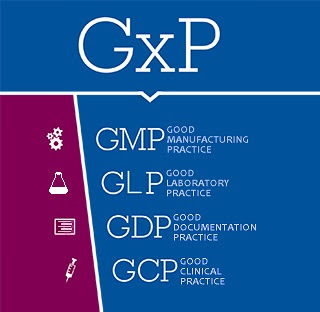 Although GxP regulations do include many varied regulation sets, the most common are GCP, GMP and GLP. To get a better overview, we need to take a closer look at each of these regulations separately and understand what impact they have on the standardization procedures of the products and services we use every day. Before GCP and similar regulations came into effect, clinical trials were largely based on the needs of national governments rather than human rights. GCP controls experimentation on humans done for the sake of advancement in medical sciences. It serves as a quality benchmark as well as a moderator that keeps such experimentation in check. According to GCP, research can be conducted on a human subject only if the expected benefits overshadow the potential risks. The needs and security of the individual completely eclipse scientific motives at all times and the individual must be aware of all tests that he/she will be put through. Failure to do so is considered a serious violation of GCP guidelines. There is a wide array of risks that products are susceptible to during the many processes involved in manufacturing. GMP primarily aims to eliminate these risks at every stage of manufacturing. The end product cannot always be effectively validated after the entire manufacturing process is complete. Many hazards such as inaccurate tagging of drugs or variations in the composition of fundamental ingredients can cause extensive harm to the end-users and are perhaps one of the worst forms of "prescribed threats". In short, GMP assures manufactured products meet their promised quality standards with minimum deviation. In fact, GMP has proved to be very effective in managing large-scale drug manufacturing units by conducting routine audits. These guidelines are the non-clinical counterpart of GCP. It covers animal welfare as well during laboratory trials. As with any other form of GxP, GLP also requires extensive documentation of the aspects it shrouds. This includes thorough documentation of lab samples and test animals. Examinations conducted on dead animals is very strictly regulated by GLP. It requires labs to handle specimens in perfectly humane ways under very definitive standards. Results are regularly reported and stored to maximize available data for future research. Besides the above mentioned GxP's, few others exist such as GDP (Good Documentation Practice), GEP (Good Engineering Practice), GAP (Good Auditing Practice) and GRP (Good Review Practice). These are not very frequently talked about although they do significantly impact the pharmaceutical industry. GxP has been a revolution that has rigorously institutionalized the medical drug industry in many positive ways. It is now a globally recognized standard and is a commonly cited term in the world of pharmaceutics. Can we add follg also to the GxP related good practices- GDP, where D stands for Documentation or Distribution; GWP or GSP for Warehouse/ Storage and also the GAMP..